Aglaia Kremezi fairly floats into the room. Wisps of casually arranged auburn hair delicate as ripe corn silk are tempered by a pair of serious wire-rimmed frames that hint at her former life as an editor and journalist. She is utterly composed and cheery all at once. This well-known authority on Greek cuisine has come to the States to promote her newest cookbook, see friends and consult with Michael Costas, Executive Chef at José Andrés’ Greek-inspired restaurant Zaytinya. 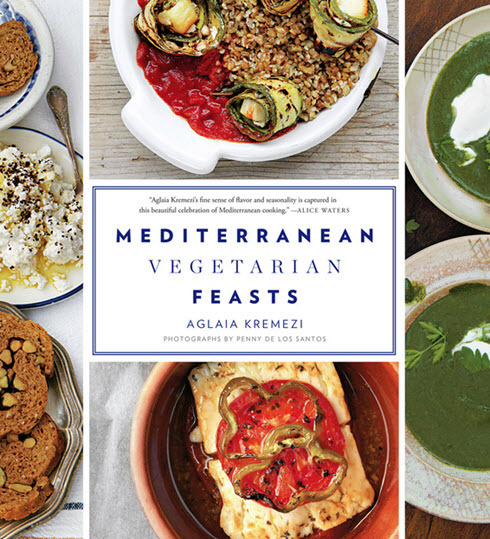 After penning five cookbooks on the foods of Greece, Kremezi has of late directed her attention to vegetables, broadening the subject by including the whole of the Mediterranean. Kremezi lives with her husband, Costas Moraitis on the small Greek isle of Kea. 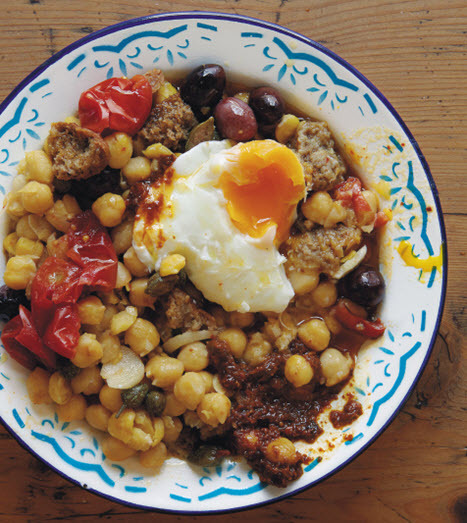 For this cookbook she has put together 150 Mediterranean plant-based recipes tested in her kitchens at Kea Artisanal, where she conducts cooking vacations for students from around the world. Many of these historically authentic vegetarian dishes are far more lavish than meat-based dishes. Whisk and Quill – What do you think of the current shift to a more vegetable-based diet? Kremezi – I think that it starts for the wrong reasons, because people think they have to eat healthier, and afterwards they consider the flavors. To me it’s the opposite. I far prefer the flavors of vegetables to the flavors of meat, even though I’m not vegetarian. How many of your recipes are gleaned from early culinary sources and how many are tweaking through doing? It’s both really. As you know, because you are a chef too, you take inspiration from this, that and the other and you add your own personal touch. They have my personality but they are taken from various countries from all over the Mediterranean and from friends’ kitchens. I hear you and Paula Wolfert are great friends and that you Skype regularly. Do you ever cook together? Oh, yes, in Sonoma and Connecticut. I’m on my way to Sonoma now to spend time with her before I go back to Greece. The photos in your new book are so vivid, I want to eat the pages. Penny De Los Santos took the photographs. She’s been to Kea for Saveur and I knew her work. I did take a few of the pictures, but she took all the rest. They are all taken in our house, garden and our outdoor kitchen. In the photos she used the plates given to me from my mother and our tablecloths, cookware and pottery that we have collected over the years. The photographs are supposed to be the ‘hooks’ to draw people into the kitchen and make them cook, because people have neglected cooking. They rely too much on take out. A lot of companies are very quick to bring vegetarian products to market, but you never really know what’s in them. Can you tell me some herbs or seasonings that are your favorites? I like both the Aegean Herb and Hot Pepper Spice Mix, and also the Lebanese Seven-Spice Mixture. That one has cinnamon, cloves, coriander, ginger, allspice, pepper and nutmeg. It’s very aromatic and a bit spicy. It’s the basic spice in Lebanon and they use it in tabbouleh. Both spice recipes are in the book. Also I make my own preserved lemons and there is a recipe for that too in the book. Wooden spatulas and spoons, my mandolin, a very good knife and scissors. I have scissors everywhere! I even use them when I am baking bread to score the tops of the loaves. It works better than a razor. Your book is going to make readers want to plant their own gardens in order to harvest the many vegetables and herbs you spotlight in your seasonally-inspired recipes. Do you get most of your fresh ingredients from your garden? Yes, especially herbs. Our seasons are different than yours. Now we are planting lettuces. I just was in Japan and got some kun choi seeds. And we have 10 or 12 kinds of oregano, like the Lebanese zaatar, which is a cross between oregano and thyme. I love farmers markets too. I was at the Dupont Circle Farmers Market on Sunday and today I’m heading over to the market in Penn Quarter to buy apples. 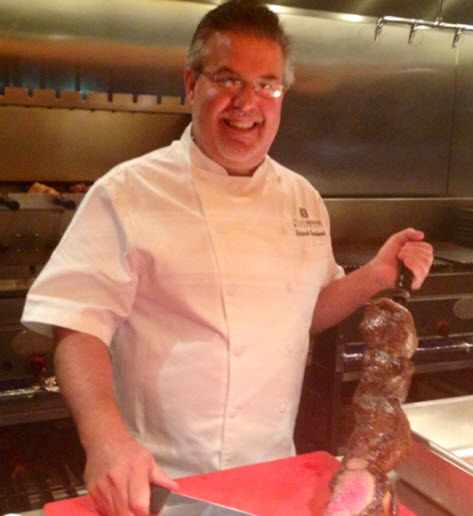 Tell me about your cooking classes on Kea. It was my husband’s idea. Because we had the garden and we live in the middle of nowhere. We are on the more remote part of the island, the north side. It’s not the side with all the villas like the Hamptons. It is where we can have a garden and it’s less exposed to the harsher weather. Also it was nice to have people from all over the world come and join us every now and then. We love having people around our table. We have six-day classes. We cook and eat and taste wines and cheeses and honeys from all over Greece. We also do hikes and make travel arrangements for guests who want to explore other islands. 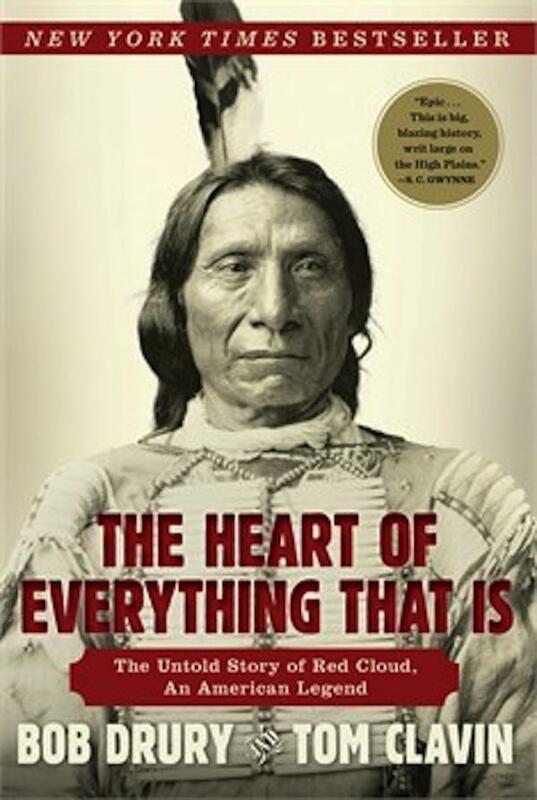 Why do you think this book is so important? The whole idea started from the interactions I had with the people in our classes. I found that things that I didn’t even think of showing people how to cook – – things I considered self-evident – – like how to braise green beans with tomatoes and onions for example. But they were amazed and they were asking me for the recipes. I realized that people don’t really know how to cook vegetables at all. In the book I have all these variations from country to country around the Mediterranean. 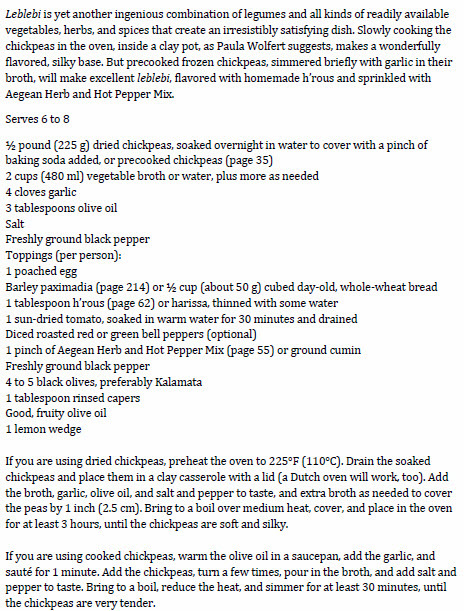 For example, I give recipes for two entirely different eggplant spreads, both the Arab and French Provencal versions. Each use roasted eggplant. It’s an example of what I’m trying to do in this book. It’s these variations that really interest me. I do a lot of research and call up my Turkish friends for advice and suggestions. Kremezi will be in DC at the Sips & Suppers event on January 24th and 25th 2015 along with Alice Waters, Joan Nathan, David Chang, Mike Isabella, Spike Gjerde, Cathal Armstrong, Erik Bruner-Yang, Michael Friedman, Carla Hall, Haidar Karoum, Charles Phan, Jamie Leeds and Peter Jacobson. 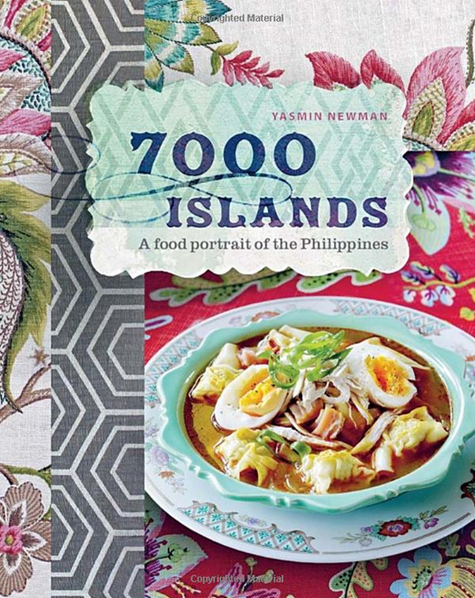 Dozens of fascinating and inspiring cookbooks have landed on our desks this year. Some from new writers, others from established authors, all eager to bring you into their kitchens and bars to tantalize you with recipes both retro and re-imagined. I’ve tried to pick out a few that are not on everyone’s radar. Here are a few that caught my eye…and my palate. 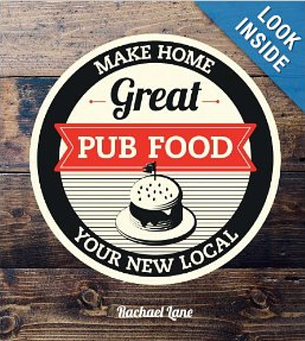 In Great Pub Food: Make Home Your New Local by Rachel Lane (Hardie Grant, London, 2013) the title says it all. In this nifty book Lane brings over 80 recipes of old school pub fare like Tandoori Chicken Burgers, Beef and Guinness Pie, Cornish Pasties and Rabbit Cacciatore into the home kitchen. Her desserts are comfort food for Brits and the Anglophiles amongst us. Two of my favorites are Eton Mess, a dessert that piles on heaps of heavy cream and strawberries, and Chocolate Stout Pudding that uses as an ingredient the creamy head from a glass of stout. Cozy up to this book before the first snow falls. Edward Lee is a celebrated Korean chef who has been in Kentucky long enough to reinvent Southern cuisine. 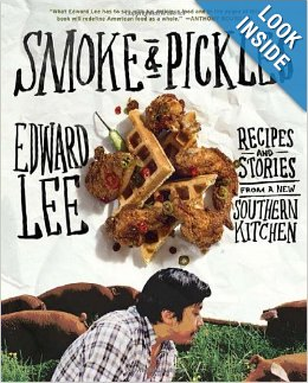 In Smoke & Pickles – Recipes and Stories from a New Southern Kitchen (Artisan Books, 2013) he has brought his Korean cooking techniques to bear on classic down-home cooking. 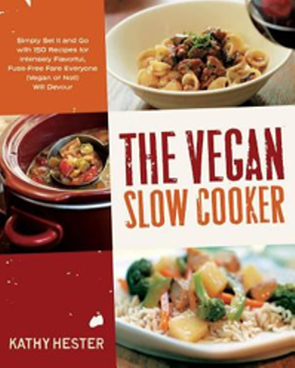 Vegans will want to get in on Vegan Slow Cooking by Kathy Hester (Fair Winds Press 2013). With over 100 recipes geared to a smaller-sized 1.5- to 2-quart slow cooker (crockpot) it’s a fantastic way to have something hot and hearty waiting for you at the end of a long day. I’m eager to try the Root Veggie Barley Risotto, Green Beans in Black Bean Sauce with Tofu, or the Bananas Foster for Breakfast – – a dish that cooks overnight. Perfect for Sunday brunch in bed! You may have caught the CNN series Anthony Bourdain Parts Unknown, in which our hero teams up with local guides to explore some of the world’s most exotic locales. The episode that most delighted me was the one on Sicily, an autonomous country smack dab in the middle of the Mediterranean. Many times conquered, and thus culinarily influenced by Greece, Italy, North Africa, Turkey and France, it is a wind-swept landscape of farmers and fishermen. 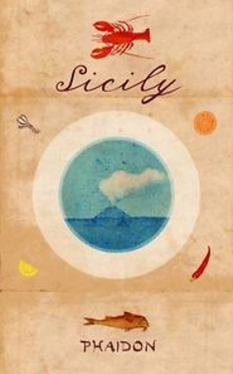 If you’ve ever been captivated by this rugged region…its beauty, its volcanic soil, its hearty foods and its equally hearty wines, pick up a copy of Sicily (Phaidon, 2013) and transport yourself to its charms. This wonderful book tells the history of the island with nature-inspired photographs and authentic recipes from the nine widely diverse regions of the island – – Siracusa, Palermo, Messina, Enna, Racusa, Catania, Trapani, Caltanisetta and Agrigento. Most dishes reflect the simplicity of the ingredients and the casual style of preparation from Sicilian pizza, Sfincione, and Timballo, the region’s signature layered pasta dish, to Maltagliati con L’Aggrassatu, a flat pasta with a buttery, cheesy, veal sauce. Each chapter begins with a beautiful story giving recipes that employ regional indigenous products. In The Way We Ate: 100 Chefs Celebrate a Century at the American Table (Touchstone, 2013) we can virtually sit at table with today’s most renowned chefs, restaurateurs and food writers (and a singer) from Jacques Pepin, Daniel Boulud and Anita Lo to Chef/Owner Michael Lomonaco of New York’s iconic Windows on the World, Chez Panisse founder Jeremiah Tower and Shanna Pacifico of Back Forty and Back Forty West in Soho. Celebrated food photographers and The Way We Ate Tumblr bloggers, Noah Fecks and Paul Wagtouicz, have created an extravagantly illustrated cookbook chronicling the rich culinary history of the last American century. Here’s the twist. 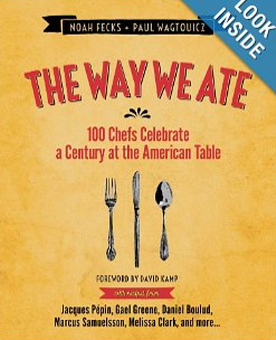 Each chef and food writer has developed an original recipe inspired by a specific year in history from 1901 to 2000. 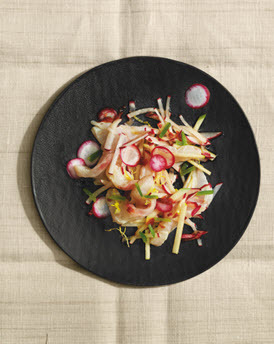 Local chef extraordinaire José Andrés has dreamed up a re-do of Beijing Glass Noodles, while award-winning chef and cookbook author Jasper White takes a turn at updating Old-Fashioned Cod Cakes. These are super chef-driven recipes, simply described and with beautiful photographs. The first one I’ll prepare will be singer Kelly Hogan’s Breaded Pork Chops with Tart Cherry Caraway Port Wine Sauce. Now where did I stash that bottle of port? 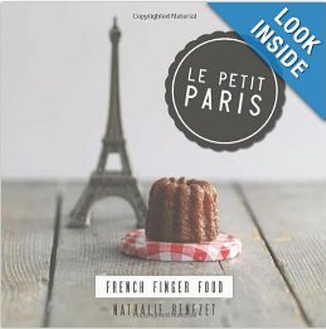 It’s always a good time to throw a party, but in Le Petit Paris: French Finger Food (Hardie Grant, 2013) Nathalie Benezet shows you how to do it the Parisian way. From Croque Monsieur to Foie Gras Burgers and Camembert Fondue, this adorable book offers chic ideas for any hostess or picnicker. I particularly like the petite Salade Nicoise in tiny butter lettuce cups for stylish tailgating, and the easy-to-make Grand Marnier Truffles. 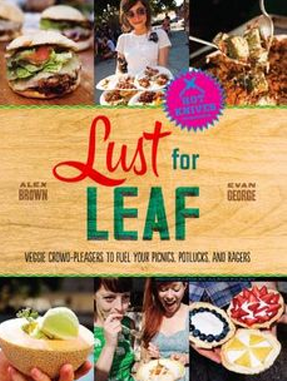 For the hipster on your list, you can’t go wrong with Lust for Leaf: Veggie Crowd-Pleasers to Fuel Your Picnics, Potlucks and Ragers (Da Capo 2013) by Alex Brown and Evan George, a.k.a. Hot Knives. That I don’t know what a “rager” is I’m sure speaks volumes, but no matter, the book is great fun and inspirational in the bargain. The two gonzo journalists and California denizens have made their mark by partying with their friends and sharing the photos of their outdoor cooking adventures. I really enjoyed this book, though it took me longer to type out the title than to flip through it, but not so long I couldn’t get a sense that these two wild and crazy guys are as serious about their bourbon as they are about their BBQ, beer pairings and musical suggestions. Can you make Kale Slaw while drinking Lagunitas beer and digging “Raw Ramp” by T. Rex”? They’d like you to try. Peanut Butter, Banana & Pickle Power Bars? Maybe not. But if I’m drinking the suggested Stone beer and listening to “Clay Stones” by We Are the World, well, why not? How would you like to have access to wholesome fresh greens loaded with protein and nutrients even in the middle of winter? How about right in your own kitchen all year long and for pennies? Then why not make a garden indoors by growing your own sprouts, a fun and inexpensive activity I haven’t revisited since my college days. 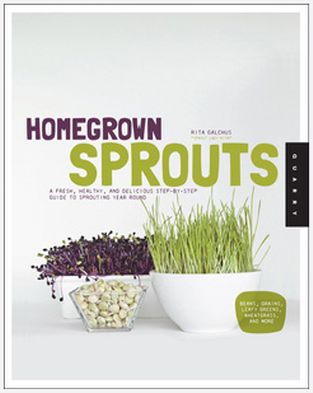 Rita Galchus, author of Homegrown Sprouts (Quarry Books 2013), makes it a snap, to grow your own sprouts explaining three major methods – – from growing them in a Mason jar or using a hemp-sprouting bag or even a sprouting tray specifically made for this simple task. Anyone can do it and kids will get a kick out of growing their own food. A big trend now is chia seed pudding, which I have seen at Le Pain Quotidian and Whole Foods. But why not make your own? It’s a snap. The book has 200 helpful photographs and ideas for how to incorporate nutrient-rich sprouts into your breads, salads, juices and spreads. You can even share these phyto-packed treats with your pets. Most sprouts only take a few days to pop out of their tiny seeds and provide a super-nutritional food source. Try radish, barley, arugula, rice, flax and sesame, or grow your own snow pea and sunflower shoots used by chefs in some of the best restaurants. 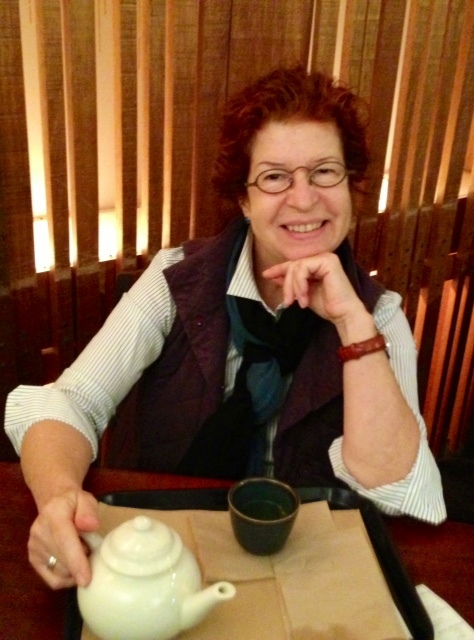 One of Virginia’s most colorful and delightful food and wine writers comes to us from the Hampton Roads and Chesapeake regions. 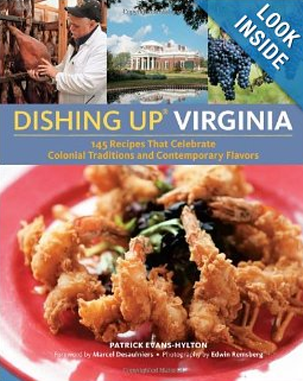 Patrick Evans-Hylton, co-host of NPR’s locally produced show What’s Cooking Wednesday and food reporter for The Hampton Roads Show has written a marvelous compendium of Virginia recipes. It’s called Dishing Up Virginia. Using his extensive knowledge of colonial foods and recipes from some of the Commonwealth’s best chefs, Evans-Hylton has crammed the book with evocative photos from bay to farm. It’s a marvelous collection that belongs on every Southern cook’s shelf. Follow Patrick at www.PatrickEvansHylton.com. Local food writer and pop culture archaeologist Nevin Martell has teamed up with Farmers Restaurant Group and Executive Chef Joe Goetze to create a cookbook showcasing the recipes from Founding Farmers restaurant. 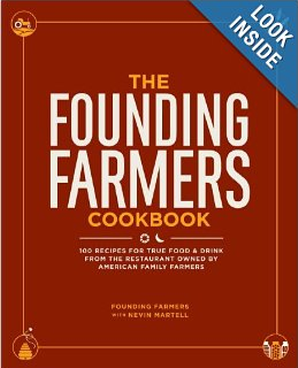 The Founding Farmers Cookbook: 100 Recipes for True Food & Drink from the Restaurant Owned by American Family Farmers (Andrew McMeel Publishing 2013) is a healthful, casual, rustic style of cuisine featuring recipes that use the farm-sourced products incorporated in their seasonal menus. If you’ve ever dined at the DC-based restaurant you’ve most likely swooned over the Seven-Cheese Mac & Cheese Salmon, Crab and Lobster Devil-ish Eggs, or the Many Vegetable Salad with 13 different veggies. Healthy never tasted so heavenly! 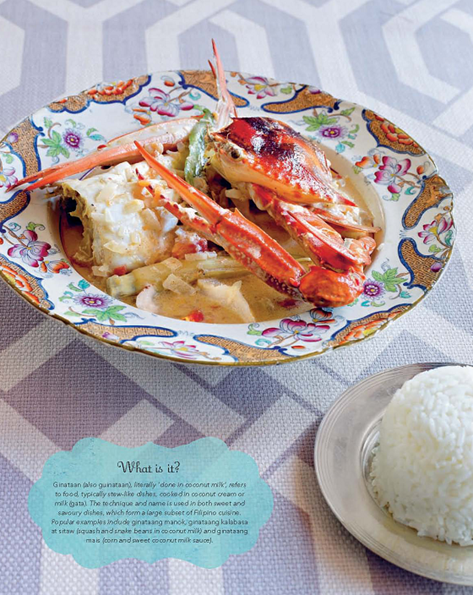 These recipes and dozens of other well-loved classic dishes are given here. As Founding Farmers co-partner Mike Vucurevitch puts it, “ A lot of dishes were based on my travels throughout America, which have taken me to every state. Sometimes my life feels like that Johnny Cash song “I’ve Been Everywhere”. To catch more of Martell’s adventures in food writing follow him at www.NevinMartell.com. 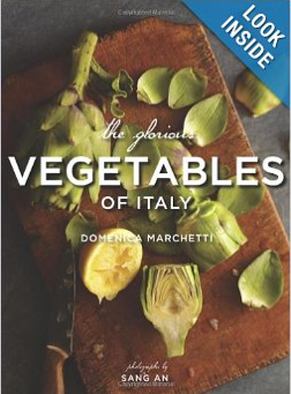 Italian cookbook writer and regular contributor to the Washington Post, Domenica Marchetti, tackles her fifth topic with The Glorious Vegetables of Italy (Chronicle Books 2013). Here veggies get 100 chances to shine. It is a tribute to her Abruzzian mother who taught her to roll pasta as a child that Marchetti is expert in all things from an Italian kitchen, both traditional and modern. The vegetable-centric recipes range from soups to antipasti and main dishes to desserts. Some include meat but not as the featured performer. Grilled Lamb Spiedini on a Bed of Eggplant Caponata, Carrot Polenta Cake with Marsala and Pumpkin Gelato show Marchetti’s versatility in the kitchen. Pizza, calzone, panini and pastas are well represented here too. Exquisite photographs by Sang An highlight the beauty of these soulful dishes. 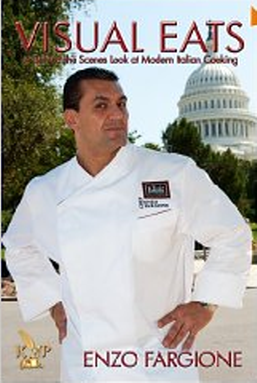 On January 23rd Marchetti will present a five-course dinner featuring dishes from the cookbook at the National Press Club in DC. Wine pairings are included. For details on the ticketed event visit http://press.org/events/verdure. In Visual Eats: A Behind-the-Scenes Look at Modern Italian Cooking (Keith Publications, 2013) renowned DC chef Enzo Fargione shares stories of his upbringing in Turin, Italy alongside insider tales of his restaurant experiences. 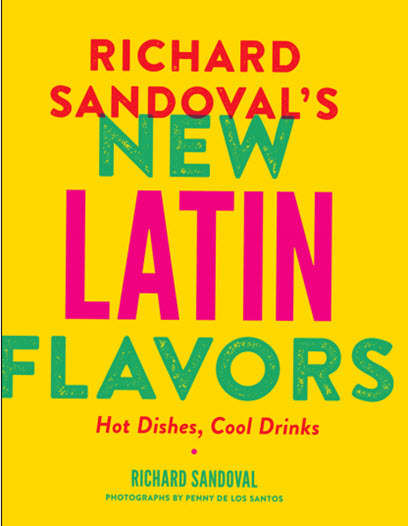 Known for his culinary sorcery in dishes that stunned the food world when he was at Teatro Goldoni (like the dazzling Four-Minute Smoked Branzino Carpaccio served in a cigar box which your humble scribe has had but once and never forgotten) are here revealed and tailored for the home cook. Now helming the kitchen at his own DC restaurant Osteria Elisir, Fargione aims to reach out and teach the average cook how to be a wizard in the kitchen. 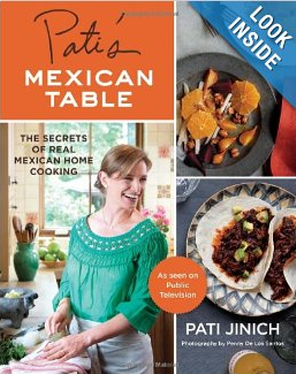 Pati Jinich, Executive Chef at DC’s Mexican Cultural Institute and host of the PBS television series Pati’s Mexican Table: The Secrets of Real Mexican Home Cooking (Houghton, Mifflin, Harcourt, 2013) has written a companion cookbook of recipes from the show. 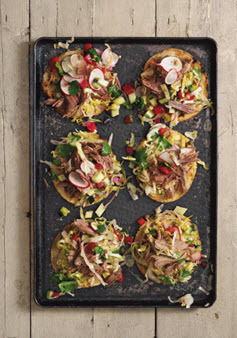 As in her show the petite blonde with the fiery cuisine shows how you can easily create regional Mexican dishes from Veracruz to Michoacan in your own home. Follow her on www.PatisMexicanTable.com. 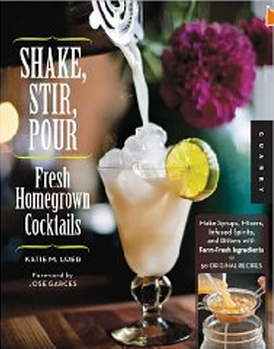 In Shake, Stir, Pour (Quarry Books, 2013) by Philadelphia mixologist Katie M. Loeb you’ll find beverage recipes both with and without the use of spirits. I’m a sucker for any book that tells a story about each concoction and Loeb does. There are more than four dozen nicely photographed recipes that use her basic syrups and infusions. I loved the Rhubarb, Pear and Thai Basil syrups, as well as infusions like Jalapeno-Cilantro Vodka and Limoncello. The book’s foreword is penned by uber-chef and Philly restaurateur, José Garcés, which gives you an idea of the company Loeb keeps. 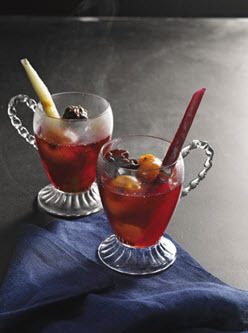 As a noted bartender, sommelier and creator of craft cocktails who has written for Bon Appetit, the Los Angeles Times and Food & Wine, Loeb will have you making and shaking up a “Gin-Gin Mule” or a “Rosalind Russell”, a throwback cocktail from New York City’s Stork Club Bar Book published in 1946. She even gives a recipe for the Aquavit that’s used in the drink.